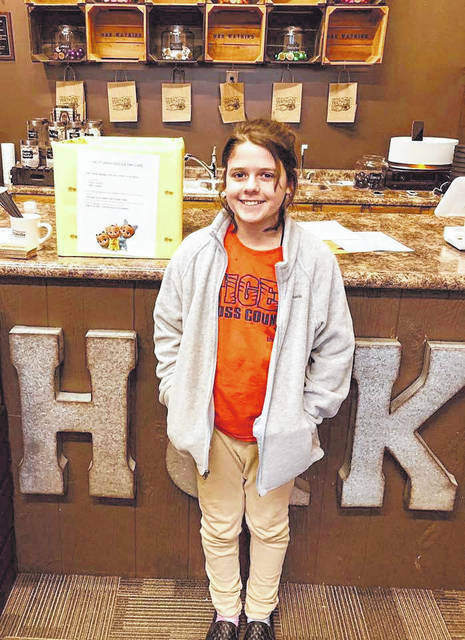 GALION — Elliot Freyman, 11, wanted to find a way to help in her community. A fifth grader at Galion Intermediate School, Freyman was inspired by the annual “Socktober” event where students collect socks to be donated to local shelters during the winter. The girl didn’t have to look far for an idea. Elliott’s dad, Troy Freyman, is on the board for Sara Beegle Daycare in Galion, and she often tags along with her dad to the meetings. “I heard them talking about how they needed diapers and other supplies, and I decided this was a way I could help,” Elliott said with a grin. Elliott made a flyer entirely on her own using her iPad and decided to collect diapers, baby wipes, and paper towels to benefit Sara Beegle Daycare. Troy took her to businesses around Galion to see if they would be a collection point for her campaign. “I was surprised at how willing they were to help out,” Elliott said. Collection boxes are in place at Fox Plumbing, Foxy’s Tire Center, Clayton’s, H.R. Wolf Hardware, Quay’s Pharmacy, Galion Fire Department, H&K Watkins, and My Floors. Elliott and Troy make a trip to each location twice a week to collect any donations that have been dropped off. Elliott said she has received around 36 packages of baby wipes, 50 rolls of paper towels, and twelve dozen packages of diapers so far. The collecting began on March 1 and will end on March 31. Donations are being accepted at any of the aforementioned businesses, or by contacting Troy Freyman at 419-295-1104 or troyfreyman129@gmail.com. Photo courtesy Heath Watkins Galion fifth grader Elliott Freyman with her collection boxes inside H&K Watkins in uptown Galion. Freyman is collecting diapers, baby wipes, and paper towels for Sara Beegle Daycare in Galion. https://www.galioninquirer.com/wp-content/uploads/sites/38/2019/03/web1_53918268_840552599639387_5208435663661170688_n.jpgPhoto courtesy Heath Watkins Galion fifth grader Elliott Freyman with her collection boxes inside H&K Watkins in uptown Galion. Freyman is collecting diapers, baby wipes, and paper towels for Sara Beegle Daycare in Galion.